1 tin of fruit of your choice (e.g. apples, peaches, pears). Grease a medium (1.2l) pudding basin with butter. Mix all dry ingredients, including zest of orange, in a large mixing bowl. Add milk gradually, until a nice, slightly sticky dough is created. Roll a third of the dough onto a lightly floured surface. Invert the basin onto the rolled pastry and cut around it to form a circular lid. Add the offcuts to the remaining pastry, and roll it out flat. Line the pudding basin with this pastry – ensuring it is nice and smooth, with no holes. Add half of the butter, dark brown sugar and chocolate into the basin. Pierce the orange all over with a skewer and sit it on top. Add your choice of tinned fruit to the basin. Add the remaining butter, sugar and chocolate. Brush the pastry edges with milk or water to create a sticky surface and place circle pastry lid on top of the basin. Press the edges together to seal and trim off any excess pastry. Loosely cover with greaseproof paper and tie with string. Place the basin in a baking tray, adding enough boiling water in the tray to come halfway up the side of the basin. Seal the tray with foil and place in the oven at 160ᵒC for 2 ¼ hours. 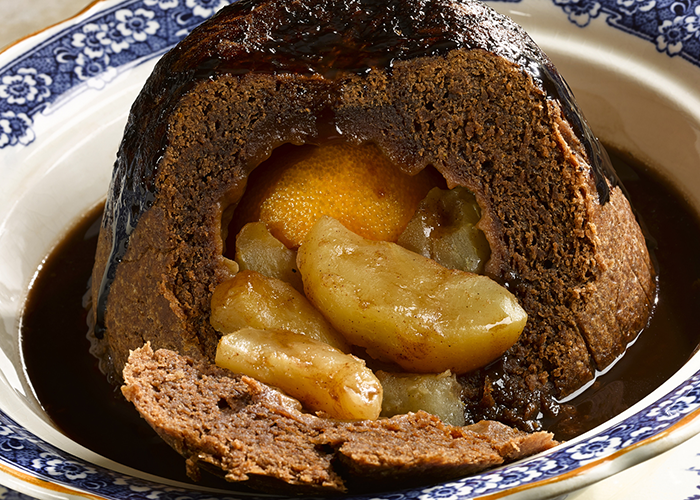 Carefully remove foil and release the sides of the pudding from the basin if necessary, by using a small knife. Turn out into a large dish and serve immediately with cream or custard.